This post is written by Dr. Bruce Robison, Senior Scientist at the Monterey Bay Aquarium Research Institute (MBARI). Remotely Operated Vehicle (ROV) dives off the islands of Raja Ampat are revealing deep-water animals that have never been observed before in their natural habitat. The protected coral reefs of this area are world famous for their beauty and productivity. We are investigating how the little-known deep-sea habitats nearby, play a major role in sustaining the richness and diversity of the reefs. For example, living among the reef-building hard corals are filter-feeding soft corals, gorgonian sea fans and crinoids that pluck zooplankton from the water. Likewise, the reef’s fishes, turtles and squid also feed on zooplankton. The source of much of that zooplankton food is the neighboring deep-water habitat. Deep-living animals of all kinds send their eggs and larvae up to the surface layers, to develop into juveniles that eventually descend back into the depths. While they mature in shallow water, they provide a principal food resource for reef animals. Aside from their importance to the reef, deep-living animals on the seafloor and in the water column, comprise communities that dominate Earth’s oceans in terms of size, biomass and numbers. These vast animal assemblages are largely unknown because they are so difficult to gain access to. 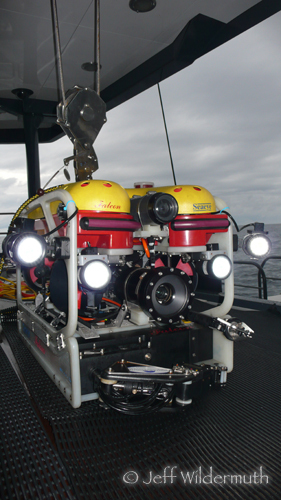 The ROV gives us the vantage point of a high-definition video camera, flying down into that remote and hostile habitat. During our dives here in Raja Ampat, we are using an ROV to survey the slopes of seamounts far below the depths that our scuba divers can safely reach. As we descend along the steeply sloping face of the seamount, sunlight fades from the bright colors of the reef to blues and grays. We turn on the ROV’s LED lights and vivid reds and oranges jump back to the screens in our control room. We are counting, identifying, and documenting the animals on the deepening slope to quantify the gradual transition from reef community to deep community. At intervals during the descent we pull the ROV back away from the wall, in order to examine the zooplankton assemblage in the adjacent water column. We see krill in abundance, arrow-worms and other gelatinous predators, as well as fishes and squids. While their general shapes are familiar it is highly likely that many, if not most, of these deep pelagic animals are undescribed species. Likewise, the animals on the sloping flanks of the seamount--fishes, urchins, sponges, crabs, soft corals and more--may mostly be scientific unknowns. We are not attempting to describe new species during these dives; in truth we are working at a different scale, trying to describe new communities. While there is a wealth of new material for future studies of molecular systematics, we are exploring the transitions and interactions between vastly different neighborhoods of animals. The ROV team--Joe Lepore, Marko Talkovic, and Bruce Robison--have many years of experience in deep-sea work. Yet before each dive there is an eager air of expectation, we never know what we will find and we are often impatient to get in the water and begin the day’s exploration. In the ROV control room, other members of the expedition crowd in to glimpse the screens when we shout that we’ve found something new, something beautiful or just something cool. 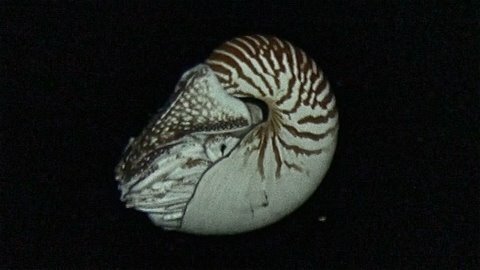 Coming upon a chambered Nautilus, twice on one dive, has been the biggest rush so far. One ecological pattern that is immediately apparent to us is that the coral reefs and the adjacent deeps are inextricably linked. Protecting one and not the other is like spreading mosquito repellant on your left arm but not the right. Conservation of biodiversity requires a holistic perspective, and we need ecosystem management policies that include the deep waters we can barely imagine, as well as those we can readily see. great to see the images coming back from the ROV. I'd love to see even more - especially of the zooplankton off of the slopes of the reef. What were the nautiloids doing? vertical movements? feeding? so many questions... meanwhile, it's raining back home in Monterey - enjoy the sun and warm waters! Nice underwater shots! Please tell Dr. Mark Erdmann that I am really proud of him. This is his long lost friend, Shirly Espinar Palacio, Philippines.